As dog owners, we're all very well aware of all the unconditional love our pooch provides us with. But one of the best advantages about having a dog in your family is all of the fun activities you can do alongside each other, like hiking with a dog, going on trips, doing sports, running or traveling somewhere far together. All the bonding time the two of you can spend together on such activities is priceless and will be remembered for a long time. Most breeds of dogs love travel, and their personal dating profile can sound very familiar: dogs enjoy trips that stretch far, they love spending time outdoors and long walks (whether on a beach or not). 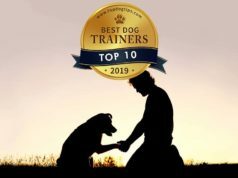 Not only do dogs enjoy this time, it's also a great exercise for them and very beneficial for dog's joints, socialization, overall health and general well-being. When you decide to go hiking with a dog, there are some precautions you need to take into account. Hiking doesn't necessarily have to be difficult, tiring or stressful, but it certainly can turn into such a trip, even if you weren't looking for it. Understanding how to prepare well and proper for a hike with a dog can be detrimental to the success of your trip together. Before you even consider hiking with a dog, you must be 100% positive that your Fido is completely obedient to your commands and there will be no trouble taking control over him. For your dog's safety and yours, you need to know that regardless of what both of you are going to encounter on the hiking trail, your canine will immediately follow your instructions. Some dogs can get distracted very easily and forget about obedience when on a completely new territory or exploring, being adventurous. When dogs see and experience new sights and smells, they simply get overly excited and the situation becomes out of hand. It's vital to ensure this doesn't happen. Your (or your dogs?) biggest problem will be all the distractions, and especially the wild animals who can be very tempting for your Fido to start chasing or getting to know better. Whether these animals are dangerous or not isn't always that important, because even harmless animals can lead your dog somewhere he shouldn't be if he gives into mindless chases. Dog owners who are not completely sure if their canines will be able to follow commands immediately and to a letter should simply leave dogs at home; it's not worth the risk. You may not want him to miss the fun, but the dangers outweigh the fun element. On the other hand, you can always train your pooch and prepare in advance. Do so yourself, or get him into a good obedience school. That way you'll know your Fido is ready for a hike with you. Even if you plan to allow your dog to hike while loose alongside of you, you need to have a leash and a collar with you at all times. You can never predict exactly what happens on the trip. There's always a chance something bad can happen; you may unexpectedly stumble upon potentially dangerous circumstances where you will need to control your pet for his and everybody else's safety. For active hikers who choose to hike with a dog on a regular basis there are all kinds of dog products and supplies that can be found useful. If hiking with a dog is something the two of you do very often, you may want to start looking at some of the better quality, professional canine hiking equipment and investing in that, which is definitely worth it. 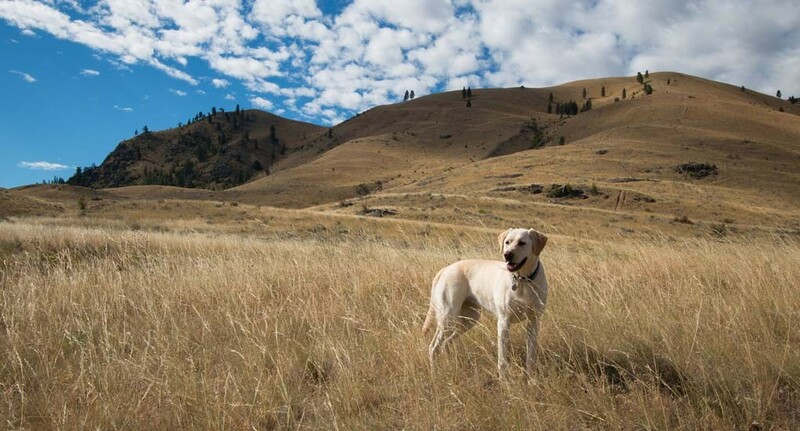 You can also work on your own methods and techniques to use when hiking with a dog. For example, if you want your dog to be attached to you but want your hands to be free, put your belt through the handle of the leash. Your dog will have room to wander and you will not tire your arms as fast as when you are holding the leash during the whole hike. However, remember that it's inadvisable to do this with larger dogs who can overpower you and cause a disaster if they get distracted. The experience of hiking in nature is amazing, but it also comes with its own set of cons. One of those are mosquitoes and all kinds of other insects. Your dog is just as vulnerable to insect bites and stings as you are, so both of you will need some kind of protection or insect repellent. Even though insect repellents for dogs work in a very similar fashion, there are specific ones designed just for pets. Purchase one if you're going hiking with a dog, and make sure to spray it on your dog before you set out on your hike. Do not use the insect repellent spray anywhere on your dog where he'll be able to lick it. The chemical substances in these dog insect repellents can be hazardous. Use it on Fido's shoulders, around his ears (very carefully) and on the back of his neck. Quick tip: Try dog insect repellent on your dog a day before you leave for a hike together. This way you'll be able to see if your pet has any adverse reaction or allergies. Many people and pets have problems with repellents that contain DEET. Your dog may become drowsy or nauseated if he is allergic to the repellent. 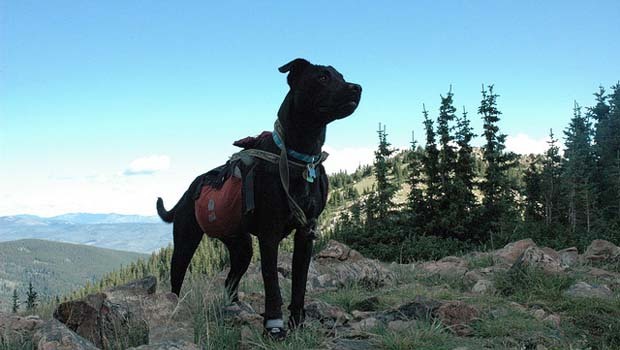 You will probably have a backpack with you during a hike, so why not let your dog carry his own supplies, too? Obviously, if your pooch is the size of a toy breed and you need a backpack just for him, then this might not be a viable option. But if you have a medium to a large sized dog who is eager to go on a hike with you, then many pet companies manufacture dog backpacks that are designed specifically to be attached to a dog's back. Some of these are pretty stylish and dogs usually don't mind helping their owners carry stuff when needed. Remember not to overload your dog, though. A good rule of thumb is to let him carry one pound of supplies for every twenty pounds of his weight. It's not a lot, but at least he can carry some of his own stuff, which is more than fair. If your pet loves to jump into water, you may want to pack all of the dog supplies into waterproof bags before you leave home. What are the best items to load into a dog's own backpack? Most owners choose to put their dog's first aid kit there and everything else a dog might need in case a health problem arises. In addition, you can ponder of whether you should also get your pet some dog boots in case you'll be spending a long time on a rough terrain. Don't forget to bring a little extra food and water for your dog. He will be burning more calories than usual on the hike, and his thirst levels will be much higher too. Not only that, but you also should prepare in case something happens when you might need to stay out there overnight. Having enough food and water for yourself and your companion is the number one priority for every aspiring pet hiker. Most dog owners love those collapsible dog food and water bowls which are much easier for canines to carry in their pet backpacks. Trail treats for the dog can also be purchased to give him a little extra energy during your hike. Your dog may want to drink from every creek he comes to, but it's important not to allow him to do so unless you're positive that the water is fine for a dog to drink there. More often than not, dog owners aren't sure if that's the case, so it's better if your pooch only drinks the water you bring with you. Dogs are just as susceptible to water illnesses and poisoning as humans are. * For additional safety tips when hiking with a dog, check out ASPCA's Safety in the Great Outdoors guide. 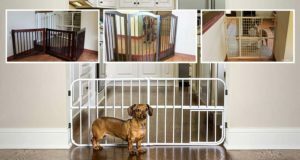 Even without leaving your home you know that accidents happen all the time, and your dog could get lost. This will be especially true when exploring new places farther from civilization. Your dog may decide to chase a squirrel, unintentionally run away from you and possibly get lost somewhere in the woods or mountains. Always ensure that your dog is wearing pet ID tags that have his name, your name and your phone number on it. If you are hiking in a very secluded are where there's no cell phone coverage, you should list someone else's phone number on your dog's ID tag. The number must be of someone who's currently at home and reachable while the two of you set out on a hike. Be smart, and avoid any potential disasters at all costs, even if the chances of it happening are slim to none. Pet owners who are turning hiking with a dog into a regular habit and plan on doing a lot of hiking with a dog in the future should definitely have their dogs microchipped. A microchip is about the size of a grain of rice and is injected under your dog's skin by a vet. Most animal shelters are able to scan dogs for microchips and will be able to see all of your dog's information easily. A picture of your dog is also a good idea to carry with you, but in today's day, it's likely you already have it in your smartphone (probably more than a hundred of them). Prepare this well is not only important to protect your dog, but yourself as well. In case something happens to you and you are unable to move and call for help, you will be able to rely on someone finding your Fido instead. Hiking with your dog can be truly wonderful, eye-opening exercise for both of you that will tie the friendship knot between you and your pooch even tighter. With a little extra preparation, you both can have a safe trip and a day full of fun.